I bought this book some time ago, in 2010, when I attended a session at the Woodend Winter Arts Festival. 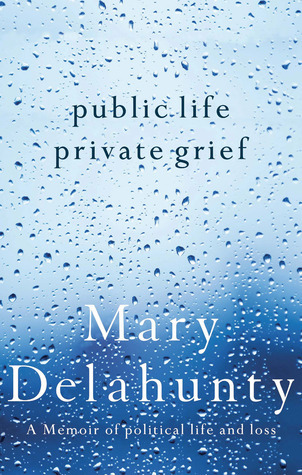 Mary Delahunty, celebrity journalist and former minister in the Bracks’ ALP government, talked about this memoir of her public life in politics and her private grief when her husband died. I bought the book it because I admired Delahunty’s honesty, and I liked supporting the local festival bookseller – but when I got home I put the book aside and forgot all about it. Life, however, catches up with us in the end, and when I was doing my annual tidy-up of the bookshelves this year, I rediscovered Public Life, Private Grief and it seemed like a good time to read it. As a memoir, the book is an uneasy hybrid of politics and the personal. On the one hand, it is a scathing critique of politics as it is practised. Delahunty loved being a minister and enjoyed developing policy, but she found the argy-bargy of question time harrowing, and when berating herself for not making more time for her family, she doubts that any speech she ever gave made a difference. It was no secret that Labor’s ‘star recruit’ found the transition from the media to politics difficult, and while she doesn’t name names, she dishes out significant criticism of the factions, the back-room deals and the tedium of it all. There are plenty who would say that she was given opportunities but was out of her depth. But what most of us didn’t know was that Delahunty’s adjustment to a new career in a minority government was taking place at the same time as her beloved husband Jock Rankin was dying of rampant cancer. It was swift and ruthless. He endured numerous operations but it killed him in less than a year, leaving Delahunty with two teenage children and the loss of her support, her soul-mate and her best friend. Within a very short time, her mother-in-law died too, and then her parents, her father not long after her mother’s sudden heart attack. The loss of a loved one is never easy, but Public Life, Private Grief shows that being in the unforgiving public eye makes it even harder. All of us feel the disconnect between what we feel and the public face we put on, and that’s no different for nonentities or the famous. Whether we are nobodies walking down the street to post a letter or celebrities fronting the media, in our culture we tend to keep grief private. We try not to weep in public. To most people, we say we are fine when we’re not. We’d rather not talk about it with people we are not close to. That’s not denying loss, that’s behaving with a bit of dignity, IMO. Where the difference lies is in the unrelenting pressure that’s faced by people in the public eye. Nobodies can retreat, stay home, take a bit of time off work, cut ourselves a little slack in our responsibilities. We can and do ask for help without fearing public exposure or derision that we are not coping. Friends and family – with whom we can be honest about our feelings – will generally be supportive. But in the relentless cut-and-thrust of politics any sign of weakness is there to be exploited, and not just by the Opposition. When Delahunty made mistakes because she was numb with grief and suffering with clinical depression, those jealous of the way she was catapulted into a safe seat were watching, and the Opposition denied government by three independents were watching too. And of course the tabloid ‘gotcha’ media was ruthless. My mouth is dry. My tongue seems to be withering as I speak and I can’t hear. I’m sealed in a mahogany and green leather vacuum pack with only the echo of my voice roiling around in it. On my feet, gripping the polished despatch box leaning into it and the ugly controlling words on the typed page before me. I’m droning on but distracted, in a near empty chamber, watched by a few circling eagles of the Opposition dry-eyed and cold. It’s been a bad morning but they didn’t know that. Another voice, strangely soft, tries to penetrate the carapace. I ignore it and plough on. He tries again, my planning portfolio shadow seated close across from me at the parliamentary table. A Second Reading Speech is the legislative stone into which governments set laws. It is written by the department on instructions from the minister and Cabinet. When amended and finally approved by the minister and Cabinet it cannot be changed by ad lib or flourish. It becomes part of a ritual and is hurriedly read verbatim into Hansard by the minister responsible for the Bill, usually to an empty chamber. A ritual that I got wrong. Well, as anyone following politics in Victoria knows, it wasn’t the only mistake, and Delahunty was dumped from this portfolio and the rumours about a preselection battle grew. Round about the same time she belatedly sought professional help and eventually resigned in 2006. She published Public Life Private Grief in 2010, and Gravity: Inside the PM’s Office during Her Last Year and Final Days in 2014. In that book (about former Prime Minister Julia Gillard), she again explores resilience amid the demands of public life, and perhaps Delahunty can count among her achievements that since these issues have gained greater prominence in recent times, there have been cases of politicians stepping aside to seek help when they need it. Fishpond: Public Life, Private Grief; (There were three second-hand copies available on the day I looked). Thank you so much for sharing this and I am sorely tempted to get a copy. I have a severe chronic illness but am the proverbial phoenix rising time and time again from the ashes. So, I have quite an interest in how people deal with grief and must get on with my own book. I have in a sense gone off the grid a bit in the aftermath of chemo two years ago. I just can’t see the point in battling over things that don’t really matter anymore. I am much more interested in helping people. Even though we could really use the extra income, my kids started new schools this year and need to get settled. They have needed me and needed to be the priority. That’s quite a luxury these days. I have also come to appreciate that much of our journey is about finding our place in this world. While the common wisdom seems to be to “make things happen”, more and more this is feeling crazy to me and going against the flow and who we are just seems mad. I wonder if Mary Delahunty experienced this. She gave politics a shot but from what you’ve said, it wasn’t her thing. That’s no crime or shame. Just another thing to cross off the bucket list and move on. I tend to agree with you: in recent years everyone seems to be buying the idea that everyone ought to have a dream, and that if you believe in yourself and work hard you will achieve it. Yet there is a whole subculture in society that refuses to be driven like this. When she entered parliament Delahunty told the world that her family would come first, and yet she came to realise that she hadn’t done that. Maybe this was just the feelings of guilt that women often have when they haven’t been able to be superwoman, and part of her denial was because her husband really believed that he could beat cancer and so she believed it too and acted accordingly. But I think that part of getting older is learning that you have sometimes made the wrong choices and wishing you hadn’t. Once someone you love is gone, it is human nature to blame yourself for not rearranging your life to fit in more time with the loved one while it was still possible. And that is true too with regard to our children’s childhoods. They are children for such a very short time, and they do need to believe that they are the most important thing in their parents’ lives for much longer than we assume when they are little. But it is hard to resist to pressure to achieve, to buy, to have more impressive stuff, to do the career, to prove women can do it, to achieve the dream etc and I think many people lose their way. That’s why I admire Delahunty for challenging that… it’s not a great book because some of it is bitter about politics and that confuses the message, but it does serve as a reminder to us to assess what’s really important and to let the other stuff go. Lisa, have you ever read “Tuesdays With Morrie” by Mitch Albom? When I tokd people about the motivational memoir I was writing, they al said it was very much like his book. For this reason, I deliberately didn’t read it for awhile so it didn’t cloud my vision. However, when I finally read it I was really struck by the similarities in his symptoms and realized the similarities between MND and the disease I have, only I have effective treatment. Morrie really values people over career and the first time I read it, I was really focused on my writing and I also am much better with older kids and trying to keep up with them when I was so sick was really hard. However, after I had chemo two years ago, everything changed. I kept my hair but ended up with no sense of time and trying to get organised is still hard. My spelling is mucked up. I’m about to have a neuro-psychological assessment to check it all out. It’s a bit like that joke about going off in a time machine and only part of you coming back. I tried going back to work a couple of times but it just didn’t compute with me anymore. I work hard on my blog, which more than stimulates my brain, even if it doesn’t earn a cent. I am still not always there for my family or able to physically do a lot but my priorities have definitely shifted from being out there somewhere to being here. Since my diagnosis a close friend and sociology lecturer Dr Kirsten Harley was diagnosed with MND. She has a daughter the same age as mine and has so far exceeded the 1-2 years past diagnosis they advise. I am very conscious that the only reason I’m alive is because I got a reasonable diagnosis and there’s medical treatment. In terms of finding where you belong rather than trying to make it happen, I work in marketing. This can be communications orrientated, which is where I now firmly sit but it can also be very statistical and database orriented, which is where I was. I didn’t mean to tak my way into the job but have since realised I told them what they wanted to hear and ended up doing statistical analysis and never talking to people. How did that happen? Huge mistake!! I really wasn’t that concerned if number were exact. I was looking for the feel of things. In retrospect, it’s almost funny. Never again! Hi Rowena, I remember all the buzz about Tuesdays with Morrie (did they make a film too? I think they did), but I never got round to reading it. But I think there are lots of books around which remind us to focus on what’s important … LOL we are just not very good at taking that advice!